Again a longer absence, explained by a lot of work at work, some health problems, not serious, luckily, but time-consuming to put right, and no progress at all in the Miele affair. I can´t stand waiting rooms at doctors´ surgeries, so I usually take a good book to cheer me up. I broke my rule by taking a book by Fredy Budzinski earlier in the week – to get things clear from the beginning, Budzinski isn´t exactly my favourite writer. There is a very readable and informative German language biography on him, belated revenge, if I may say so, by Renate Franz: Fredy Budzinski, published by Sportverlag Strauß in 2007, ISBN 978-3-939390-43-5, so I won´t enlarge on his life and achievements, which were numerous. What I like about Budzinski is his painstaking correctness. 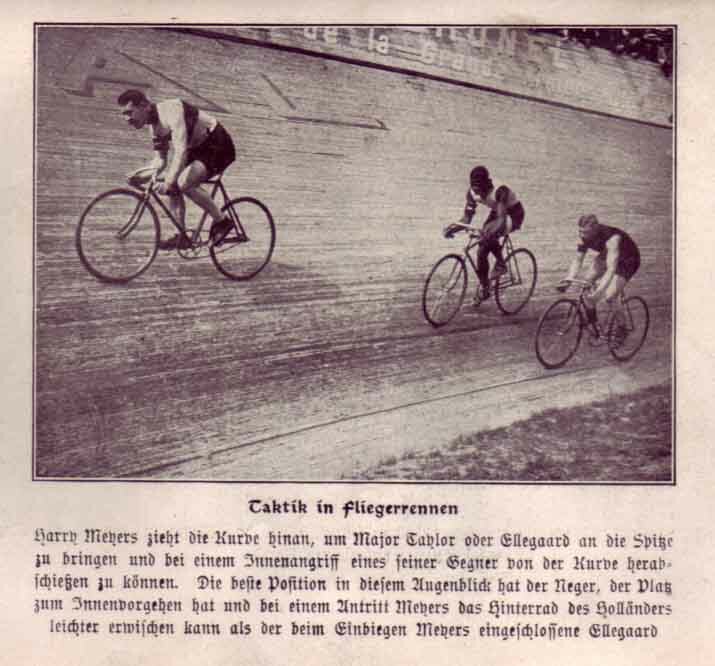 He left a huge archive, purchased by Cologne University a year after his death which is a mine of invaluable information on cycling. 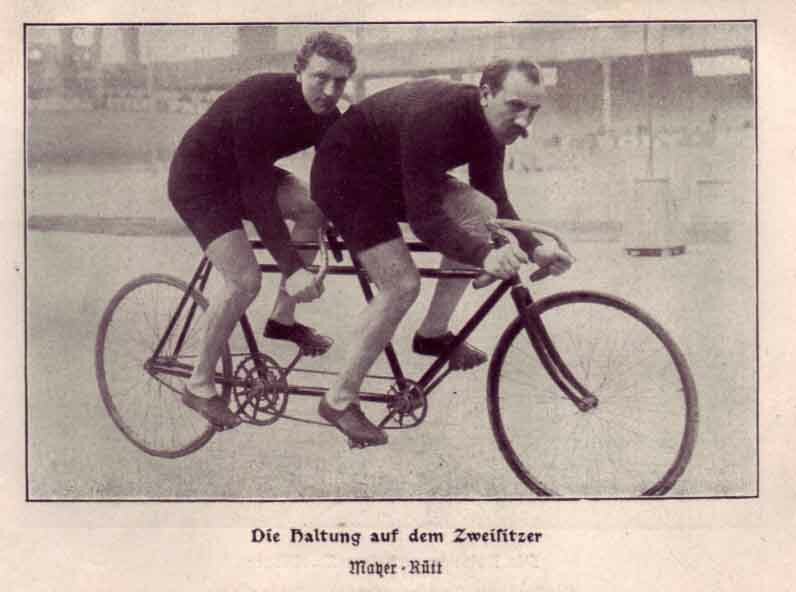 I used hundreds of his facts and figures when I wrote my own book on early motor pacing. What I can´t stand is his style; pompous, repetitive, militaristic, bourgeois, it unites all the bad qualities inherent in arrivé writing pre-WWI. 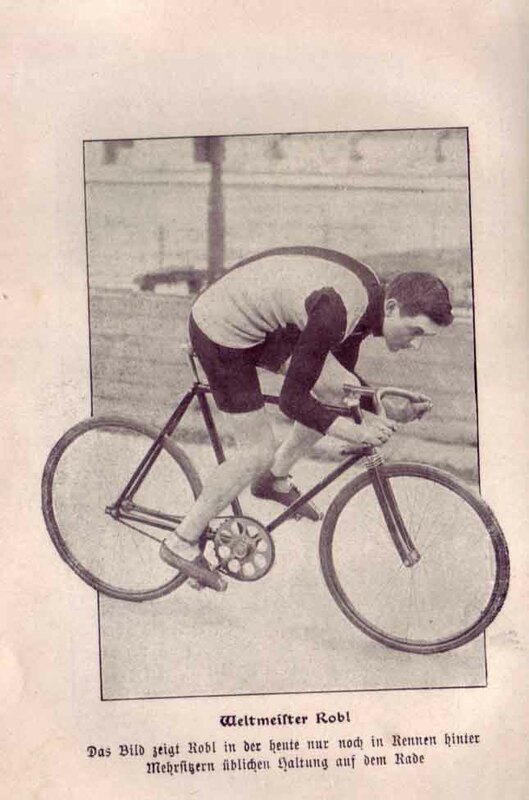 How to become a racing cyclist, 1919 edition, is all of that. 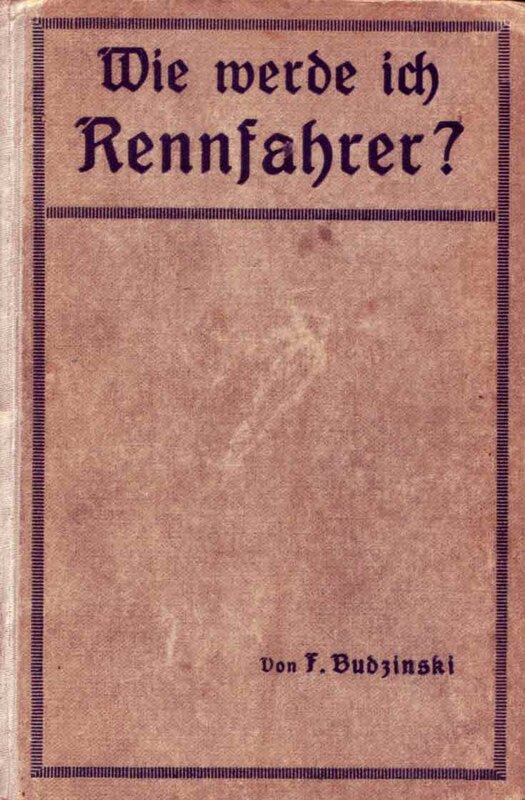 In his unbearable foreword Budzinski expresses his longing for pre-war conditions, understandably, but somewhat futile, and forgetting that he favoured the policy which led to the war. A cropped version of it also is in my book. 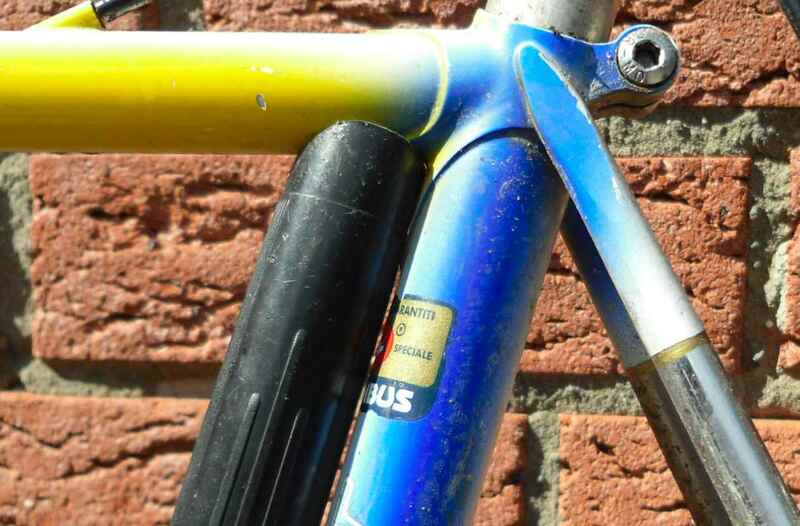 The machine Robl rides is a great track bike, and although Robl was a famous motor paced racer, this is an unpaced track machine the fork rake of which is something to behold. I think Robl is wearing a black, white and red jersey as the Reich champion. No black, red and gold in those days, of course. Budzinski explains all aspects of cycle racing important to a budding racer. How much does it cost to start a racing career? 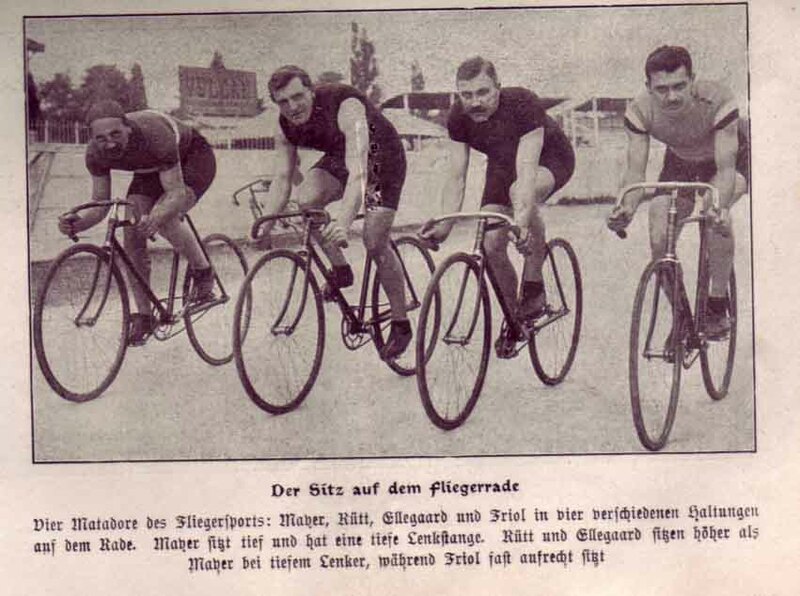 Here you go: The bicycle, 150 Marks; spare tyres, 13 Marks; pump etc, 10 Marks; clothing, 12 Marks; track training ticket, 10 Marks; track accomodation, 10 Marks; licence, 6 Marks and 40 Pfennigs; cyclists´union fee, 7 Marks and 50 Pfennigs, so all in all you need 218.90 Marks. This is typical of Budzinski who often tries to quantify the unquantifiable and who is precise to the point of absurdity. Another example? 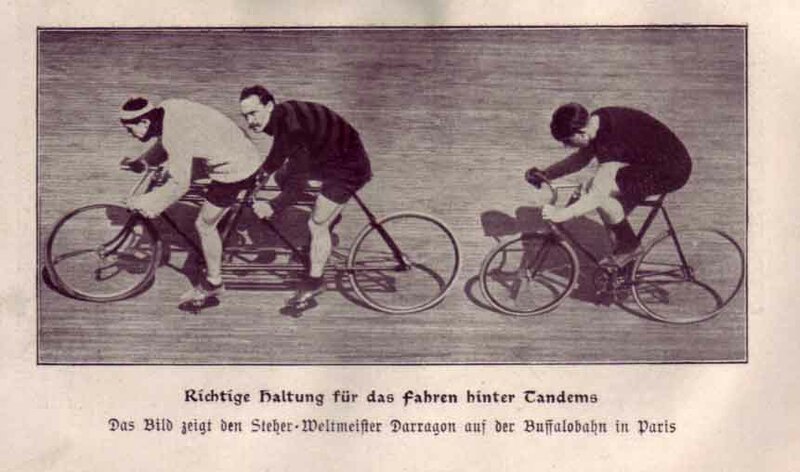 How about a list of 28 racing cyclists and their favoured crank lengths? The range is from 165 to 177 mm. These four are in the list, so we know their crank lenghts, if nothing else. What do you have to do to get a licence? What not to lose it again? How to train? And what about smoking? It´s a no-no, of course, but Budzinski assumes that it´s not the tobacco that is harmful, but the paper in which a cigarette is rolled. Not sure if this is genuine or a photoshop snap avant la lettre, though. 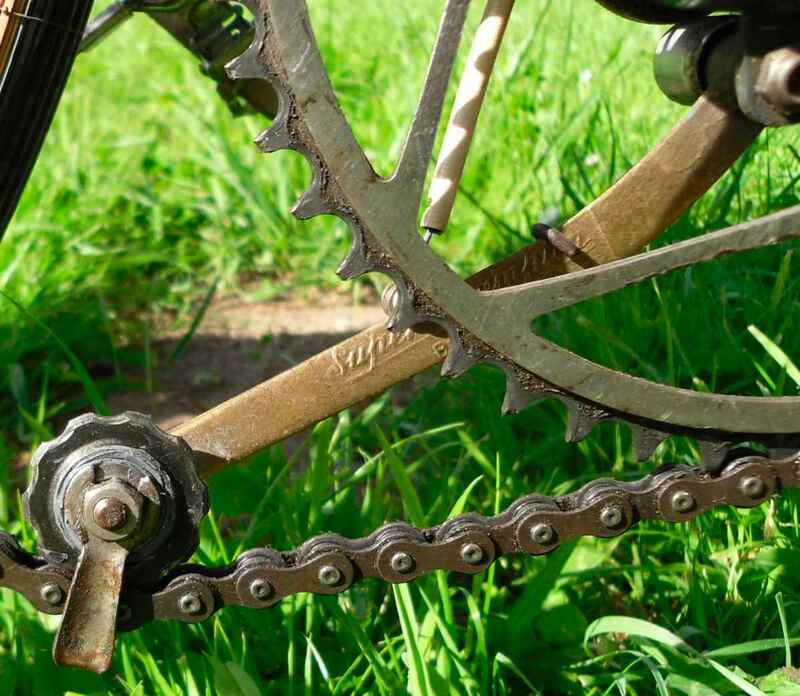 To be able to watch the two zooming around the track… Look at the rear chainwheel and the sprocket. Mayer´s moustache must have fluttered in the wind. 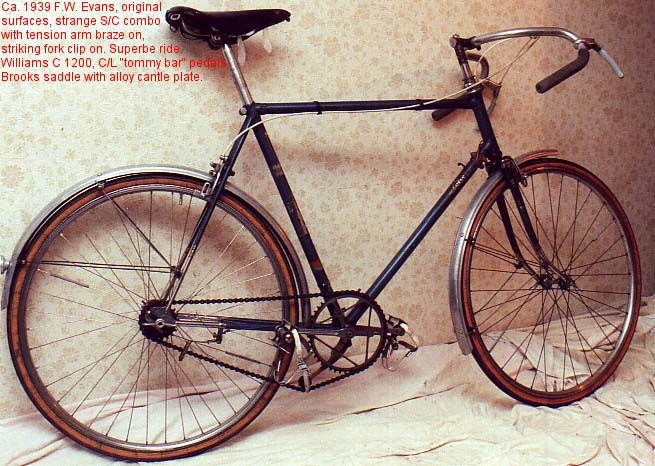 Here we have an early paced machine, already showcasing a smaller dia front wheel but still with straight fork blades. 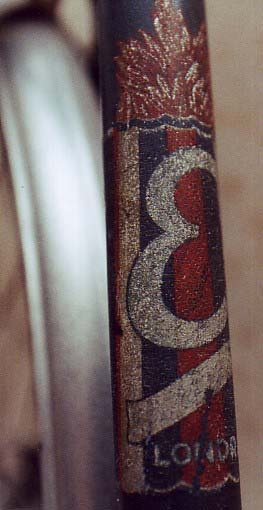 Reversed curve blades were introduced a few years later. All about the development of stayer machines in my book (ISBN 978-3-931965-23-5). There´s dozens more photographs in Budzinski´s tome; however my copy already is somewhat fragile, and I didn´t want to stress the binding any further by making still more scans, so these will have to do. Good news or bad news – what shall I start with? OK, the bad news. I haven´t posted anything for 11 days, and I will not be able to do much more about the blog in the next fortnight or so. Not fishing for compliments here – those who think that this really is the good news won´t read this at all. The good news is that after all this time I still remembered my wordpress password (pressword?). 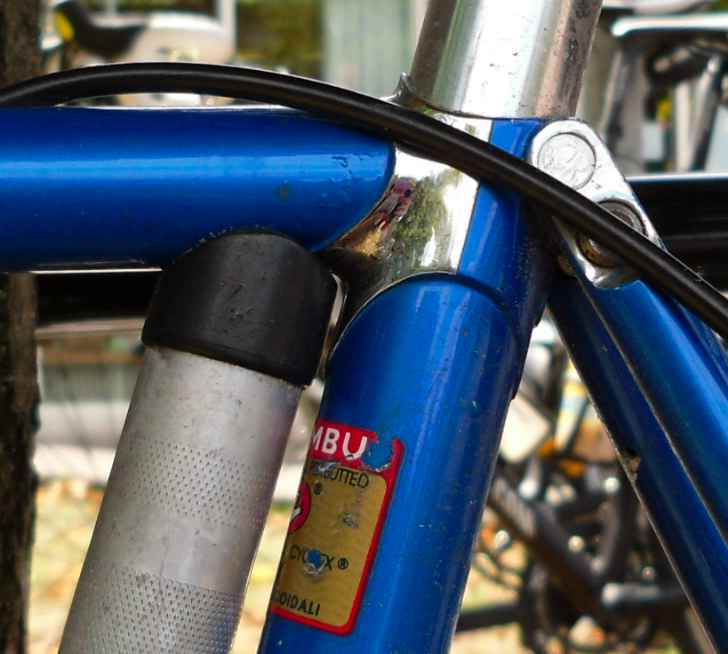 About nine years ago, when we moved house, I sold all my Miele stuff because there was less room for our bikes, especially my bike collection. 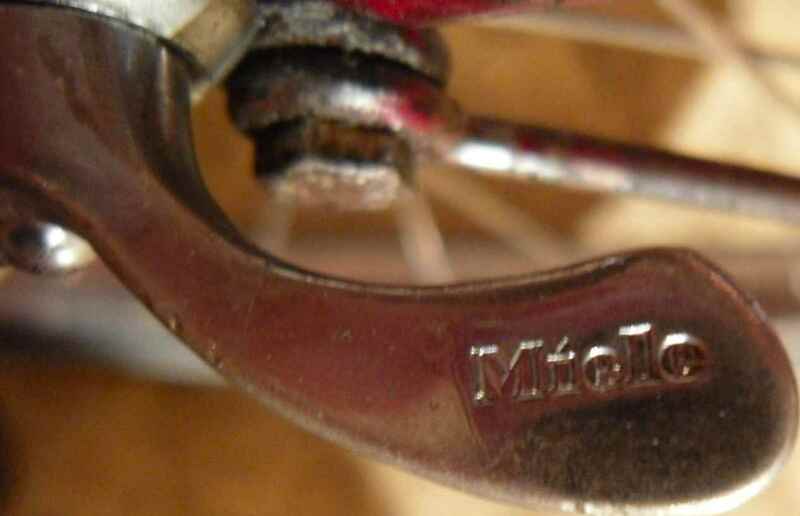 Some years later, some cyclists in Gütersloh/Germany got together and founded a loose group of late adopters of Miele bicycles, the last year of production of which had been 1960. 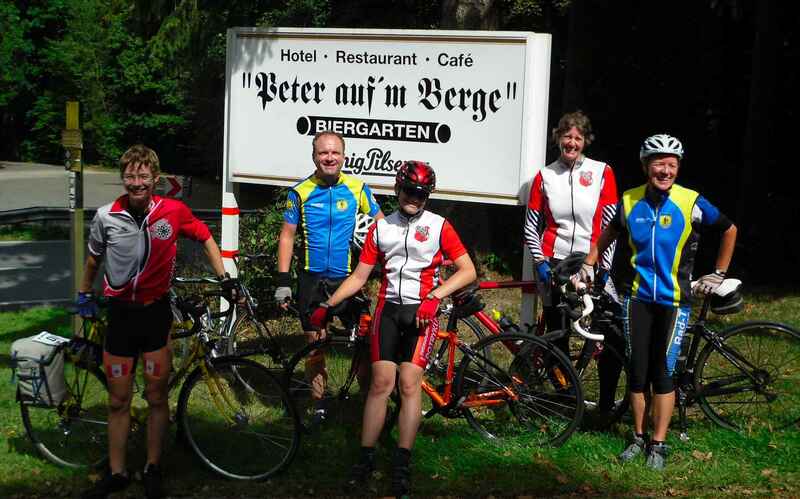 Of course I then wished I still had had the bikes I had sold, especially the sports bike, as those riders in Gütersloh really mean it: They go on long rides, some longer than 200 km, on their trusty steeds, and they are kind enough to let me join – under the condition that I ride a Miele. 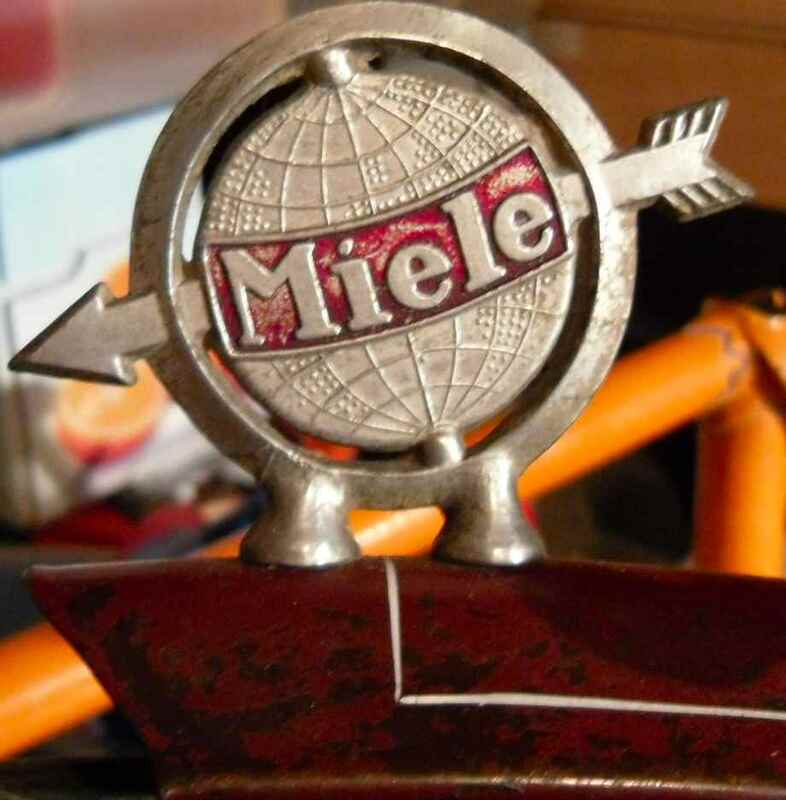 Fast forward to late July of this year: A friend rings to say he has a Miele frame which he wants to sell, could I come and have a look as it seemed to be something special. And it was; I bought it on the spot. 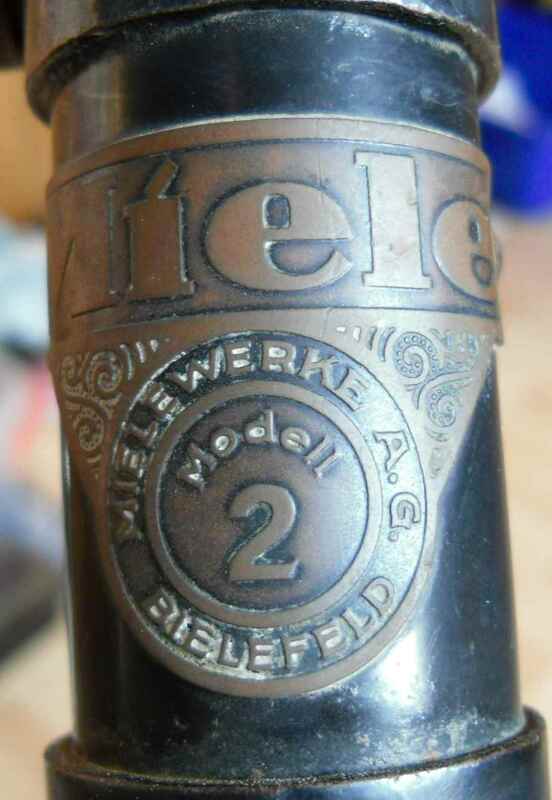 At home, perusing the fantastic “Miele historische Technik” website, I found to my amazement that the frame I had just bought (that´s all there was left of the poor bike, frame, forks, headset and b/b bearing plus crankset) was made in or around 1930, quite early for Miele who only started making bikes in 1924. The transfers and lining are still original, and it seems that the b/b bearing is unique: Available only on request, no other specimen seems to have survived. 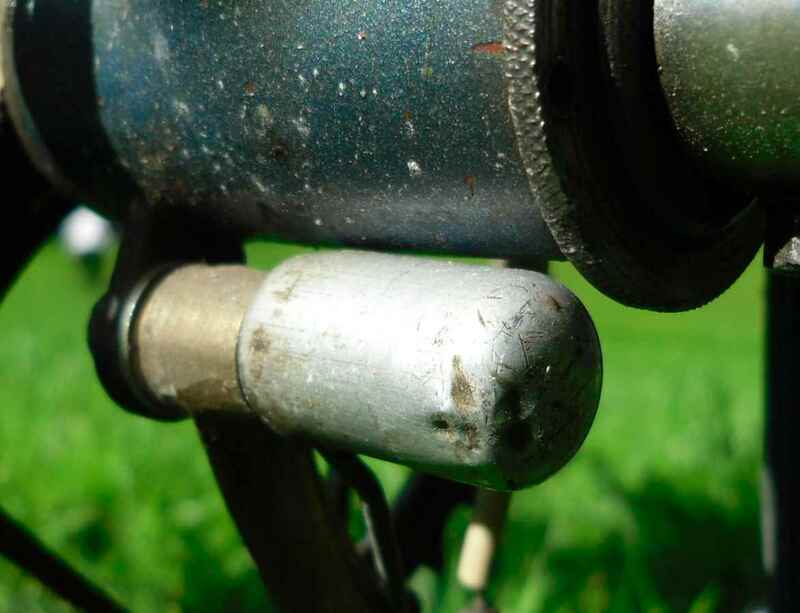 As the bearings still are very smooth indeed, and as oil or grease had seeped out of them onto the b/b shell during the frame´s long storage time, I thought it wise not to do anything about the bearings. 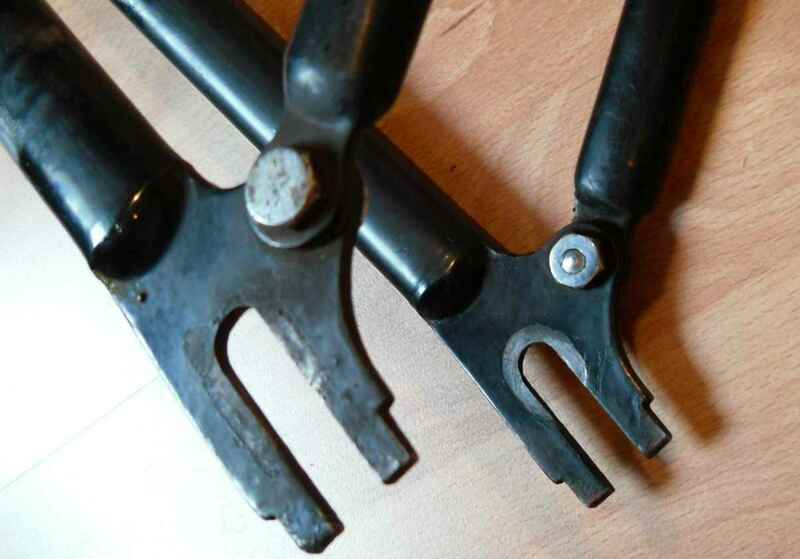 German square taper steel cranks from the classic era have no crank puller threads so they have to be prised off using a special technique, mainly consisting of wielding a large hammer. 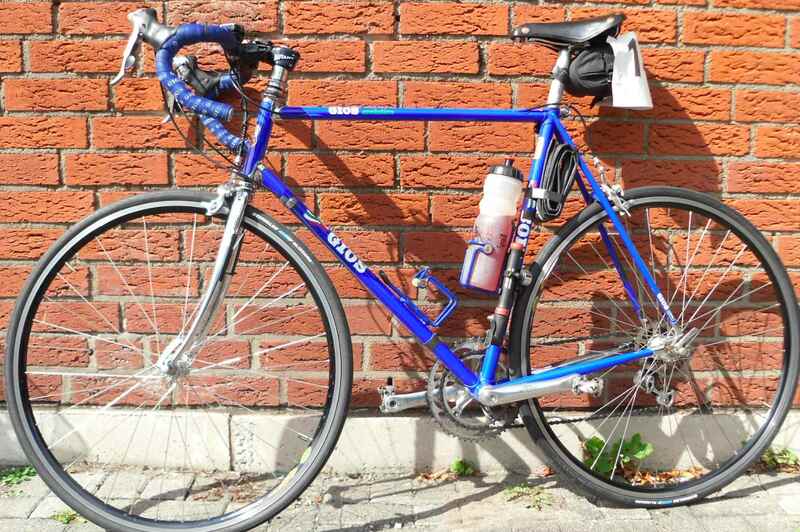 The really good news is that, while the frame is definitively too small for me at 55 cms, the top tube measures 62 cms, so a long seat post will do. 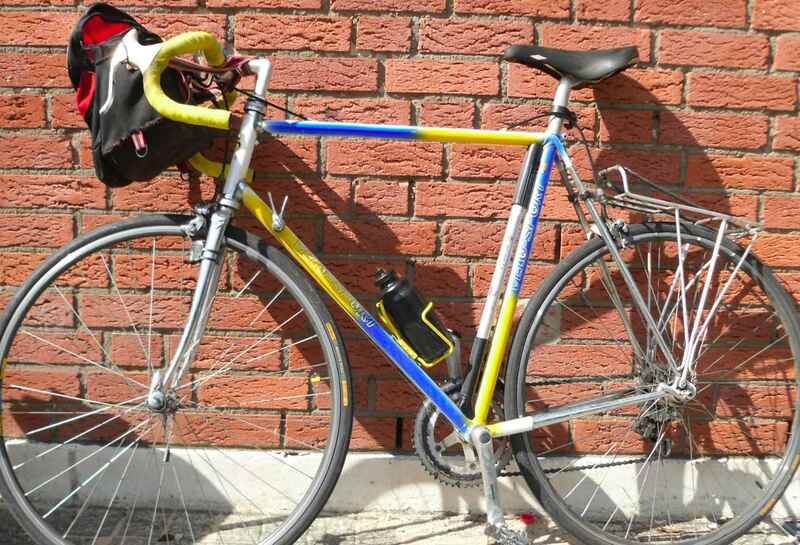 A quick search in my boxes revealed that I had nearly everything at hand I needed to make a quite nice 1930s tourer: A pair of 1930s mudguards came with the frame, a pair of beautiful Dunlop Westwood rims was in another cellar. 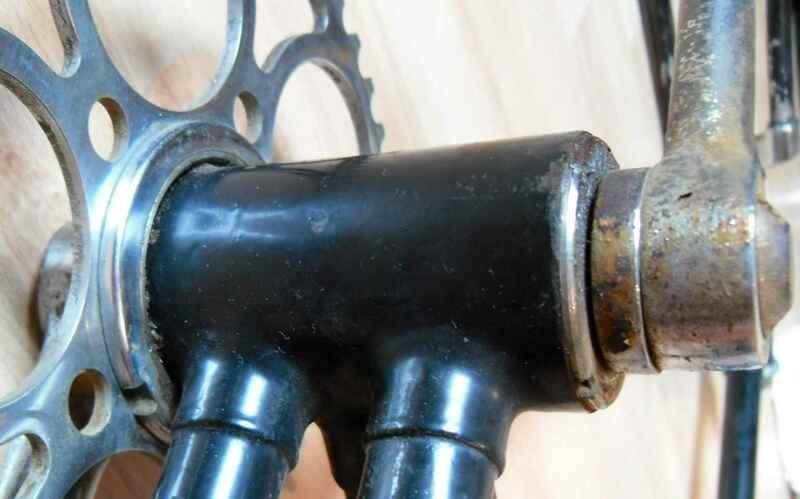 I had this idea that I wanted roughly period correct gears for the long rides I plan to go on riding the Miele, and of course reliable brakes, so I hit on the idea of using a pair of late 30s Sturmey Archer ABC and BFC hubs, some rare spares for which (“Patent applied for” trigger, for instance) I already had. A wrecked fifties Raleigh ladies roadster found quite by chance a couple of days before the Miele rendered a nice old fashioned pair of handlebars, 635 mil tires and some other goodies, so that I was ready to go. 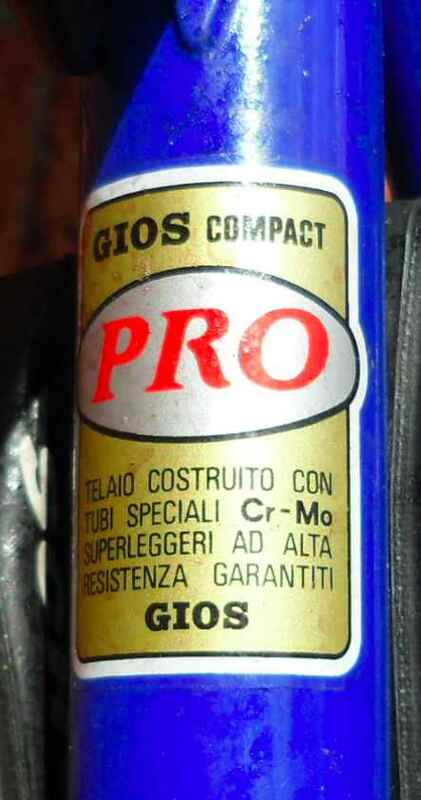 But what with wheelbuilding (including freeing the rims from rust, old spokes and useless hubs), finding spares like a long steel 25.8 mil seatpost or special nuts, bolts and washers, also solving the many problems that come with rebuilding such an old bike which must be reliable and comfortable for a century ride, a ground up and rather involved restauration like this one takes ages to finish. 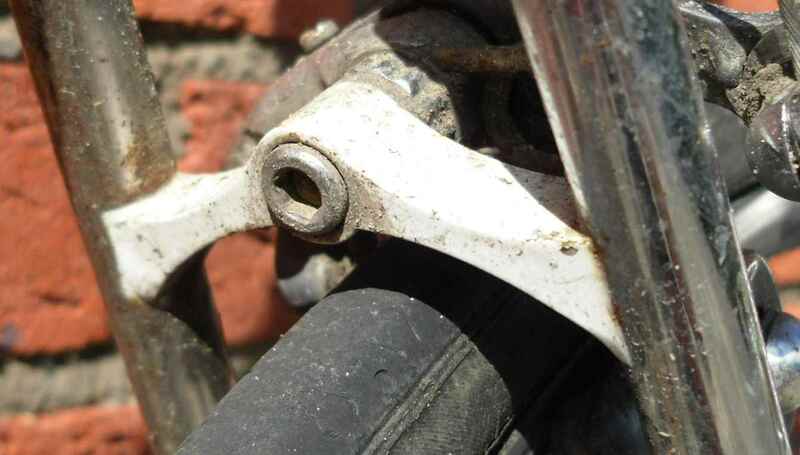 Sometimes progress is so slow that it´s not visible at all on the bike in the repairstand, for example when one has to fix a loose headbearing cup that is moving about in the headlug. A friend had the right idea how to settle this problem and was kind enough to come to my house to get it done. That´s why there´s only very few snaps here, and also why I have spent so little time on this blog recently. There´s a job to look after, too, and a family. Part of the family, my son, wants to take part in the fun of joining the Miele cyclists´ group, so we had to get a bike for him, too. That´s the red one a few teasing details of which are visible at the top of this post. 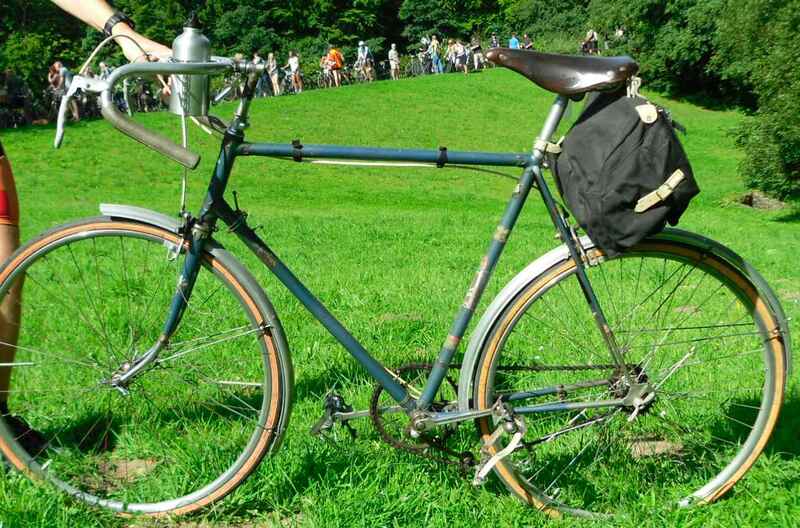 It´s a rather rare and well kept 1952 sports version with a three speed coaster hub and modern rims. 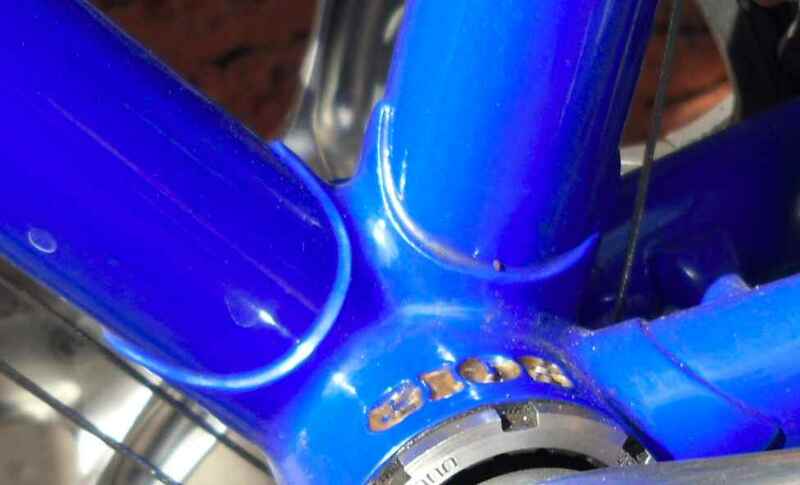 We bought it for a moderate sum from Heinz Fingerhut at Velo-Classic – it was the only nice Miele he has had for sale for some time as it seems that well preserved examples are sought after, so we were lucky again. 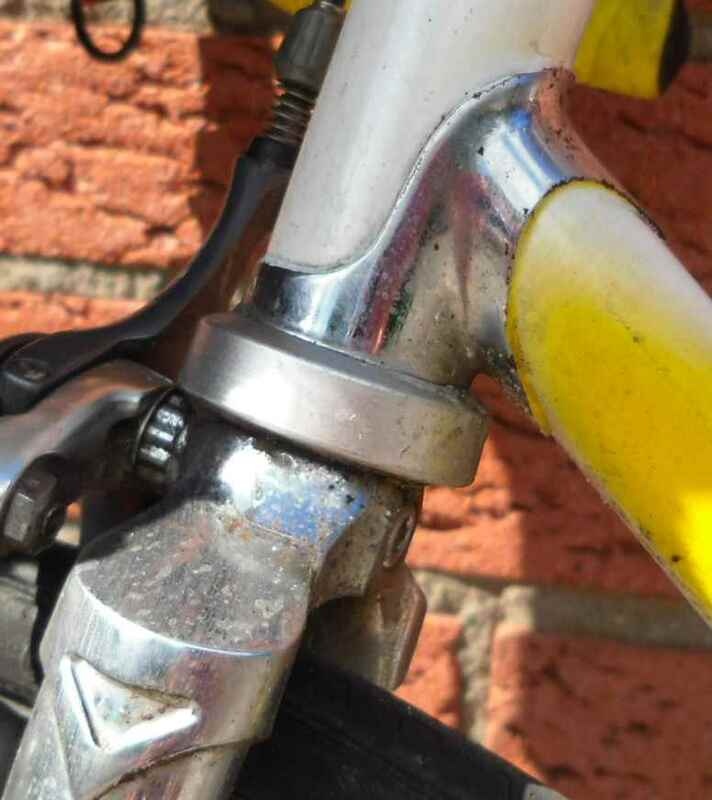 We repaired this bike, no restauration necessary, and excepting the bearings damaged by some former owner by overtightening there was not much wrong with it so my son has used the bike on two rides already totalling about 100 miles. 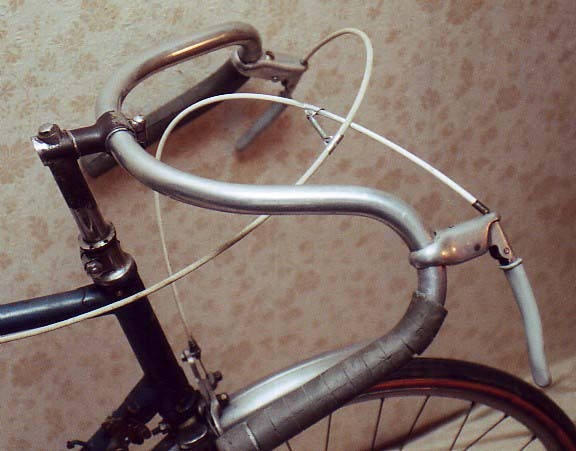 That problem out of the way, I could start in earnest with my bike. 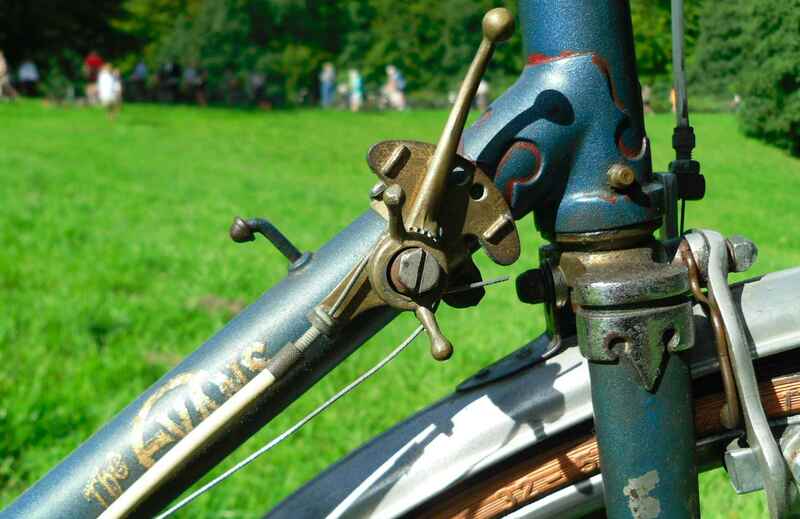 I´ll be back with a proper post and some photos of the finished 1930s bike soon, I hope. Sometimes it takes me years to find out something that really should have been evident from the start. When I got this ca. 1941 FW Evans Super Continental in 1997, I was smitten at once. It didn´t have the Osgear but an FW, and it was sold to me as being 1939. I rode it a lot with the FW and just loved it: Responsive, not too harsh angles. 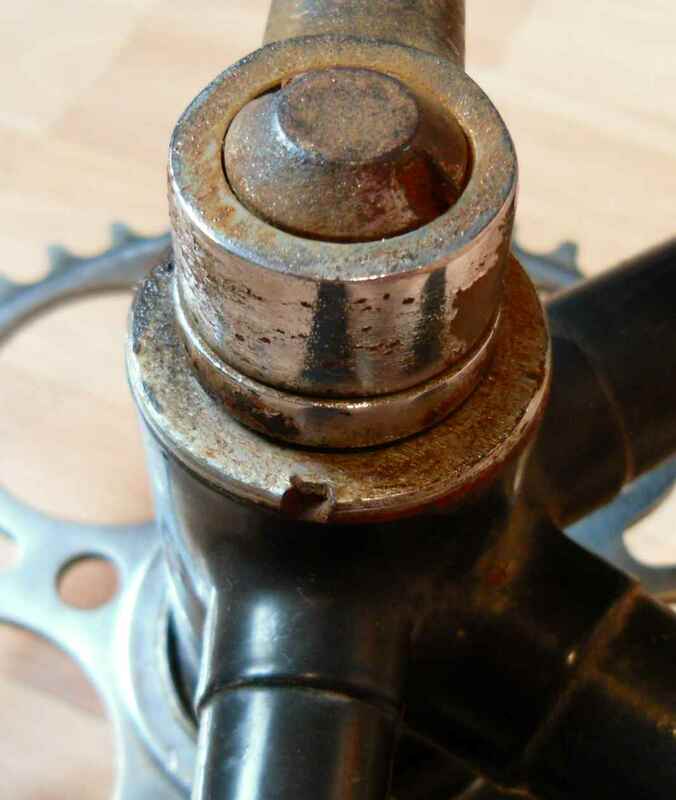 The former owner had fitted the FW, destroying the original tied and soldered spokes, because he wanted a gear hub instead of the double fixed that he had found on the bike. 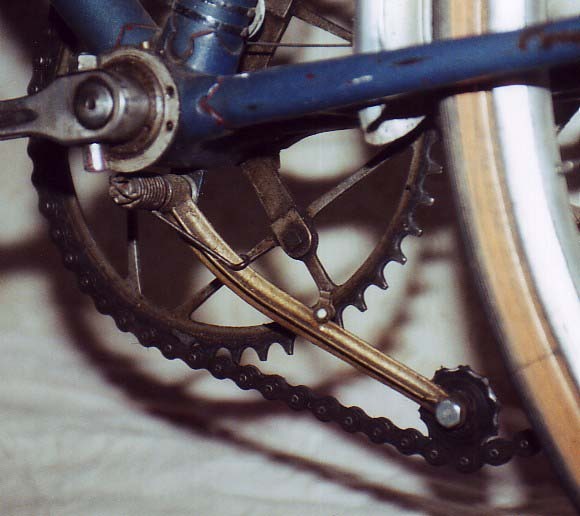 The front wheel has the original spokes to this day. 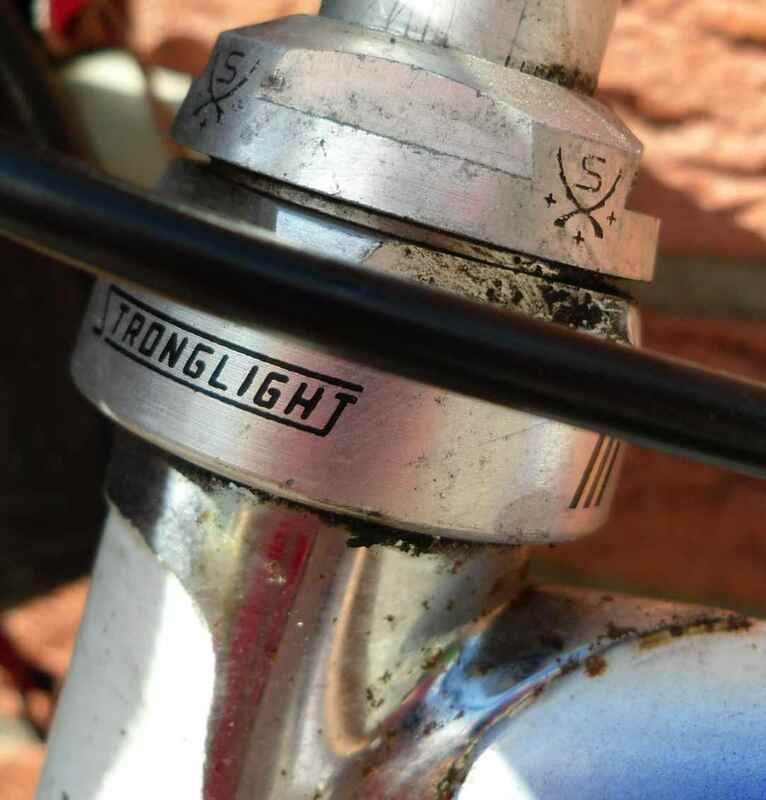 What I noted even on unpacking the bike was that there was a braze on for an Osgear Pro version under the b/b. I didn´t have an Osgear then, let alone the short arm version, so I went about looking for one. 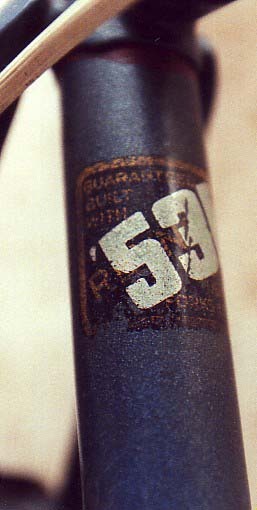 A friend called a short time later to tell me that he had been sold a rather strange Osgear, one without a clip on the tension arm, when he had expected to get the standard version. I asked him not to return it and so I got the arm and the striking fork, albeit no gear lever. I had found a copycat Osgear in a French scrapyard some time before, and until I got hold of an original lever used that. After some years I got hold of another scrapped Osgear which rendered the alloy spring cover and a roller, and after I had installed that I had a complete pro version pre-WWII Osgear, one of the first gear change mechs to be allowed i.e. 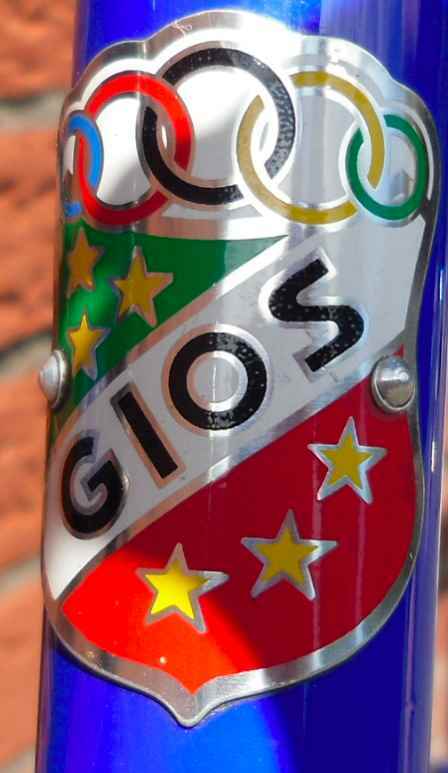 in the Tour de France. 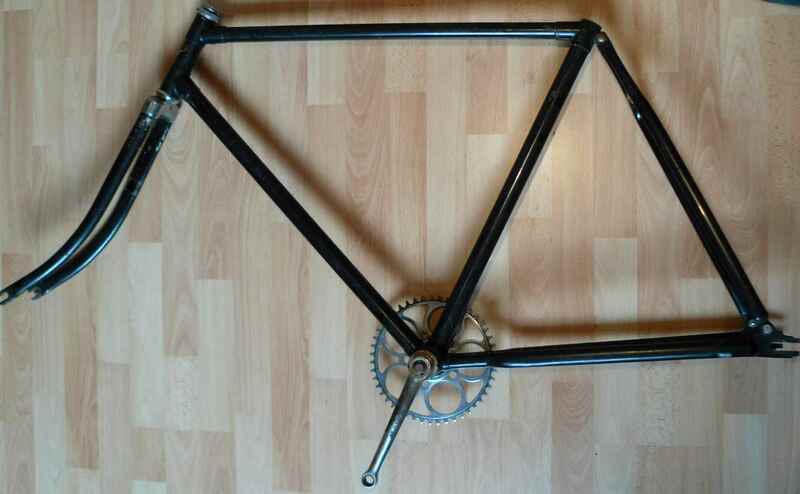 The frame as such also is a beauty. 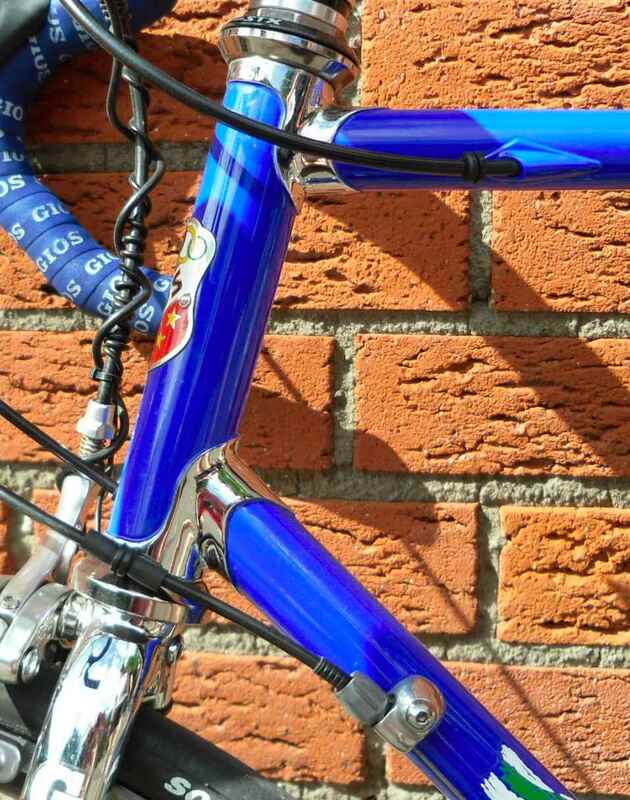 It still has a great deal of original surface with the Evans Super Continental transfer still recognizable. Look out for the French “Londres”. or the surprisingly comfortable Lauterwasser bars. 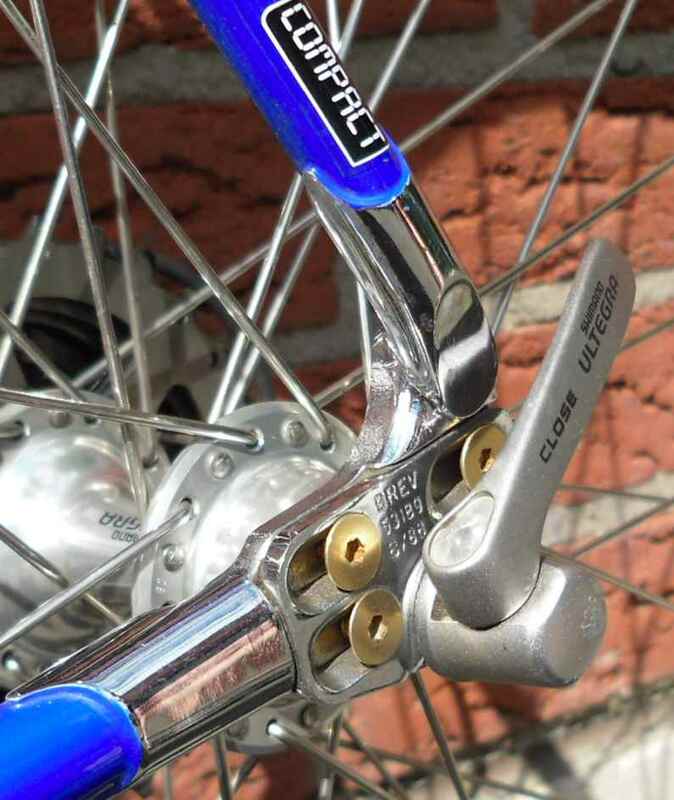 The owner before me had also chucked the original LAM brakes, and it took me the best part of one and a half decades to get another ridable pair – not because they are so super rare, but because I wanted the right ones. 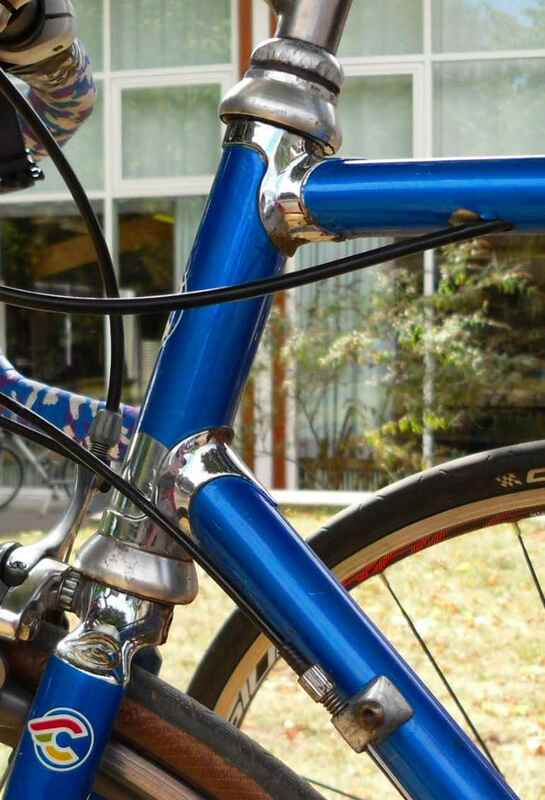 As soon as I´ll find the time I´ll edit this post to enlarge on what made this bike so special (British and still fitted with a derailleur), and what a CTC Silver Plaque is. I´m horribly behind with what I could publish here (rides, special bikes, book reviews) in relation to the time I have available. Also there´s a restoration of a ca. 1930 Miele going on, so I hope you bear with me.